Probably every woman at least once in your life closed for the winter fragrant Apple jam. There are a huge number of variations of cooking. One of the successful combinations, an addition of walnuts and cognac. In this case, the jam acquires a spicy flavor. And if you use a slow cooker, the cooking will be simple and interesting process. 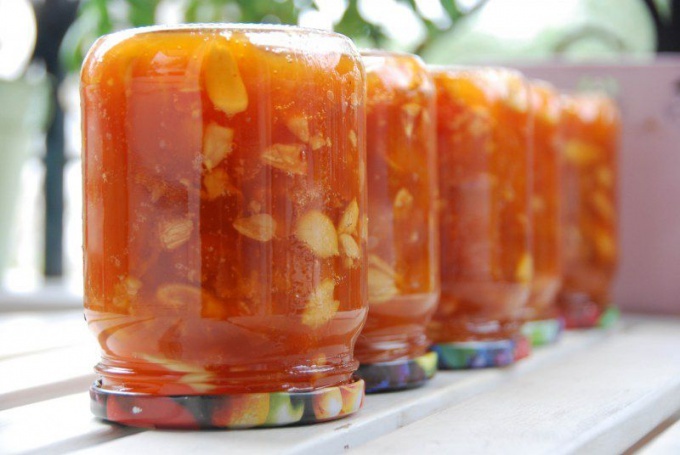 To make fruit jam nuts using a slow cooker, it takes 500 grams of ripe apples and 120 grams of peeled nuts (walnuts). In addition, you need to add the lemon (1 PCs. ), 100 grams of sugar, brandy (1 tablespoon). Great spice to this jam will be butter (3 sticks). Still, we need 100 ml of water. In walnuts that can be added to jams, a lot of vitamins E and C, contains useful carotene, protein. Apples – great source of iron and vitamins. Therefore cooked the jam will be very useful and will hurt less in the winter. Apples are washed and cleaned, then cut to make wedges. Washed rubbed with lemon zest, juice obtained. In the slow cooker, poured in water, added sugar and apples, zest with lemon juice, cloves. The function of "stir-Frying" is switched on for 15 minutes. Then, laid out the nuts and added brandy. Enable "Baking" for 10 minutes. In the process of cooking the ingredients are thoroughly mixed. Ready jam is rolled into pasteurized container. While the jam is cooling off, banks need to hold inverted, covered with a warm cloth. You can then put in a dark place for storage.